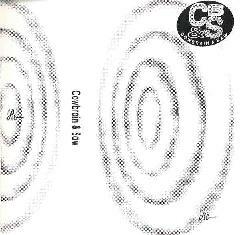 Cowbrain & Saw - "Re-"
Cowbrain & Saw is the solo project of New Yorker Ron Anteroinen, with vocalist Chrisa Yfantopoulos on one track. All instrumentation is synths and samples and Ron does a does a good job of creating varied sounds. Anteroinen is a song-writer and the songs are the focus here. But what makes the music so interesting is Anteroinen's dramatic Peter Hammill-influenced vocal style and the dark atmospheric, sometimes quirky music that backs his songs. I don't want to get readers too focused on the Hammill comparisons but Anteroinen does clearly attempt to sound like Hammill. However, the only other comparison is the lyrics. Musically, a distinct CB&S sound does emerge as the tape progresses. One of the attractions and strengths of these songs is the focus on vocals as well as music. Anteroinen likes vocal harmonies and utilizes multiple layers of his own vocals on several tracks. "Turnings" features him singing against a kind of sequenced á capella harmonized background. "Ever Changing" is like an avant garde barbershop quartet. And on "Winter" his Hammill vocals are joined by what could be various ethnic choral groups. "Mozambique" is one of my favorites with its quirky raw African percussion and synth-produced trumpet. Despite my focus on describing the song-oriented nature of CB&S this is actually some pretty wild and difficult-to-describe stuff. Very interesting home taped music and a solo project worth checking out. For more information you can email Cowbrain & Saw at cbrainsaw@aol.com.